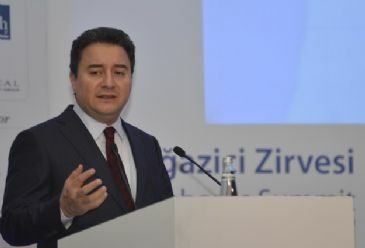 ISTANBUL - Turkey's Deputy Prime Minister Ali Babacan depicted a more positive global economic outlook for the remainder of 2015 compared to 2014, despite major concerns over slow progress in economic growth and low demand. Babacan, who chaired the meeting because Turkey is the interim president of the G20 group, spoke at a press conference of G20 finance chiefs meeting in Istanbul. "Overall, compared to the beginning of last year, we are now in a better position," Babacan said. Finance ministers and central bank governors gathered in Istanbul for a two-day summit, amid major doubts over sluggish global growth, more volatile currencies and deflationary pressures on some advanced economies. Babacan said a strong recovery in the U.S. and the U.K. and an overall decrease in EU unemployment rates are all part of the "better news." But the minister also said that there are "many risky areas." The World Bank reduced its global growth forecast in January to 3 percent from an earlier prediction of 3.4 percent. "In some countries, potential growth has declined, demand continues to be weak, the outlook for jobs is still bleak and income inequality is rising," the final communique of the meeting said. "Some advanced economies with stronger growth prospects are moving closer to conditions that would allow for policy normalization," the finance chiefs also noted. The rapid fall in oil prices was felt by the global economy, although its impact on economies varied. "The decline will increase the purchasing power of oil importing economies and will exert downward pressure on inflation, though temporarily," the group said. "The sharp decline in oil prices, reflecting both supply and demand factors, will provide a boost to global growth, but with varying implications across economies." The G20 countries called on countries to seize the opportunity of low-priced oil for further investment. Another point of concern has been the strengthening dollar against other currencies in the past six months, which has pressured emerging economies. Meanwhile, IMF chief Christine Lagarde urged for a rapid implementation of commitments made by G20 countries in Brisbane in 2014. The G20 group made more than 1,000 commitments as part of investment strategies to boost the global GDP by 2 percent and to tackle unemployment. "Given the risk of persistent low growth and high unemployment faced by many countries, time is of the essence," Lagarde said in a press release following the meeting.